It was a full sprint at the finish line, but even in a busy year in which I only saw a baker’s dozen of live-action movies, I did manage to get to all nine Oscar nominees for best picture. That’s the first time that’s happened since I left Variety. I’m glad I did. 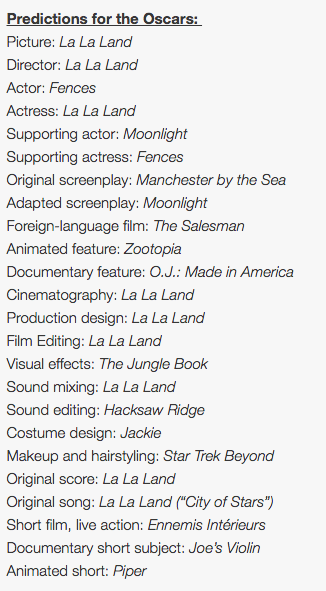 Usually, there’s at least one nominee in the bunch that I find inexplicable, if not horrible. But I had positive feelings about every nominee, all the way to Hacksaw Ridge, which I had been avoiding until it became the final unseen nominee on my list. The initial plotting in Hacksaw is somewhat by the numbers, but it’s a powerful story and it more than does its job of making you feel both the horrors and heroism of war. Still, my favorite movie of the year is La La Land, and I’m not dissuaded by the backlash that complained about its supposed superficiality or the quality of the singing. The film resonates with me today, months after having seen it, and is more complex than many of its critics give it credit for. I don’t buy the argument that you have to have Broadway voices to make a musical sing. In many people’s eyes, the best picture race has come down to La La Land vs. Moonlight, and I don’t begrudge those hoping Moonlight takes the big prize. But as much as I appreciated the latter, La La Land is triumphant for me. Of course, I’m someone who was also happy with The Artist and The King’s Speech, which from every story that I’ve read about them over the past few years, you’re not allowed to like at all. The most underrated movie of the year for me is Loving, whose omission from the Oscar picture nominations is hardest for me to understand. It’s an important story, the execution of that story is essentially flawless, and it’s the kind of story that should fit into the Academy’s wheelhouse. In a year of big stories told intimately, Loving was the best of any that I saw. Jeff Nichols, who also wrote and directed Mud and Take Shelter, deserved better. The Lobster is another movie that was worthy of best picture consideration, though it’s far easier to understand why it didn’t get a foothold with the Academy beyond an original screenplay nomination. If I were limited to a top five, it would be La La Land, Loving, Moonlight, Lion and Arrival. Lion was a satisfying movie experience from start to finish. Arrival began slowly for me but finished strong, leaving a deep impression. Heading into Manchester by the Sea, I expected I was about to see the year’s best picture winner. And while it was well done — with Michelle Williams’ performance stealing the show — it was a movie that I was done with about as soon as I walked out of the theater. At the time, I was watching the final season of AMC’s Rectify, which had the quiet lead character with a troubled past like Manchester but was doing it much more compellingly, week after week, and Manchester suffered by comparison. It deserves its best picture nomination, but not the Oscar. I have no complaints about the film adaptation of Fences other than what happens with Denzel Washington, my pick to win best actor, in the final stretch. I know that’s part of the point of the story (and it gives supporting-actress favorite Viola Davis one last moment to show she wasn’t a supporting actress), but it just seemed to leave a hole in the production where a punch should have been. Hell or High Water was strong — a Bonnie and Clyde for the post-recession era — and with Manchester, Lobster, Fences and Hacksaw, it takes a spot in my top 10 ahead of Hidden Figures, which also has a great story but presents it in a clumsier fashion than some of the others. In particular, the story of Octavia Spencer’s character, who is treated as a glorified administrator for virtually the entire film when she was so much more, really seems to get short shrift. The two other live-action movies I saw were also completely entertaining. Florence Foster Jenkins was a good watch — as old hat as it is for Meryl Streep to get an Oscar nomination, it doesn’t come by accident. Meanwhile, Simon Helberg and Hugh Grant are also really terrific and help make the film a winner. And I’ll also throw some positive support behind Eddie the Eagle, which we saw on something of a lark early in 2016. The movie knows what it is — it doesn’t try to make itself into something grand, but it also isn’t stupid. If you catch this one on the small screen, I’ll bet you enjoy it. I’m not nearly as positive on the animated films from 2016 I saw this year. While not as good as top animated films of past years, Moana is the best of this year’s bunch, by several degrees, and yet the broad consensus is that it will lose best animated feature to Zootopia, which was forgettable. Kubo and the Two Strings had a good story, but the anglicized voice acting significantly undermined it. Finding Dory, Trolls and The Angry Birds Movie did little more for me than pass the time with my kids.